As I mentioned in a previous post, each month I am challenging myself to scrap my Top Five (photos or stories or events) from the previous month. 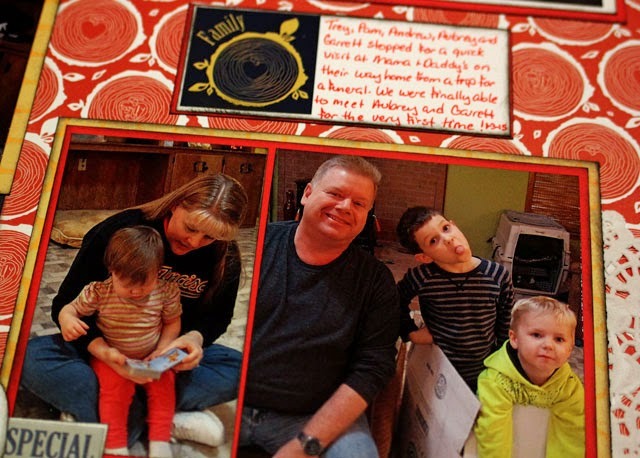 I used another one of this month's sketches from the Simple Scrapper membership materials for my layout showcasing photos of a short visit with my nephew Trey and his family when they stopped by my parent's home in early January. There's actually another story I want to tell with the photo of me reading attempting to read a little book to Aubrey, so I'll be using that same photo again in a connections layout at some point. All that icky winter weather has finally made its way to Texas, and we are iced in for the second day in a row. Luckily Robbie's able to work from home using remote access to his work computer. Of course, it also means that our new refrigerator will not be delivered today (so I don't have to worry about cleaning it and filling it) and I'm putting off the calls I need to make about appointments and such (because many offices are closed or short staffed), so I have an entire day in my craft room! [Yippee!] I'm planning to work on my other two January Top Five layouts as well as complete and photograph the make & take projects from the Scrapbook Expo so that I can share them with y'all soon! What are you working on today? I'll be working on another LOAD layout... after this contract revision gets done. Unfortunately, weather does not prevent me from working! 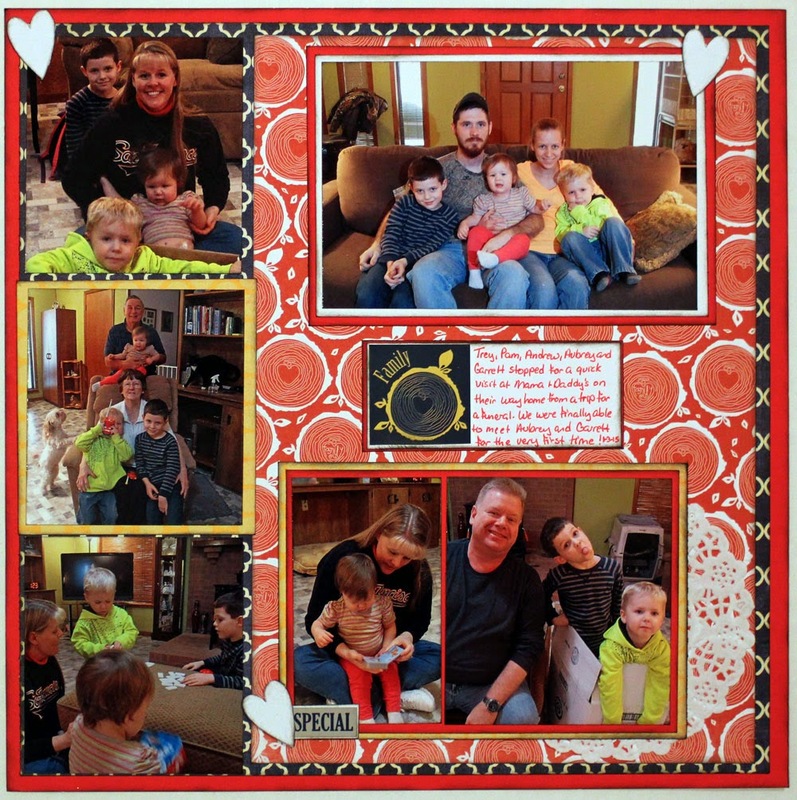 This is a great layout, Melissa! I've spent the day making the cards I need for all the March and early April birthdays since we'll be traveling nearly all of March. I have one more to go for a friend who received great news today about her cancer diagnosis. Nice job, that heart paper is adorable. I realized today when taking stock of how productive February was for me in the studio that it was totally dependent on the weather being so cold and nasty. I'd trade a little of that away for some warmer temps. Enjoy your day in your craft room! I'm sure we will see some wonderful layouts just like this one. This is a great layout! I spent the day at our Leeds office and then travelling home. It's very rare that the weather here is do bad that you can't get to work and this winter has been very mild with no snow in our part of England! Fabulous layout! Love the photos and the paper!